Ajarn Neng isn’t your typical looking holy man. Dressed in a loose, soiled singlet and casual pants, he’s covered in an intricate array of tattoos, and snorts frequently from a thin metal snuff pipe. Yet in this dimly lit room, amongst the smoking perfumed incense and a huge display of wooden buddhas and animist masks, there’s a feeling that something is happening here. Something powerful, something spiritual, something magic. 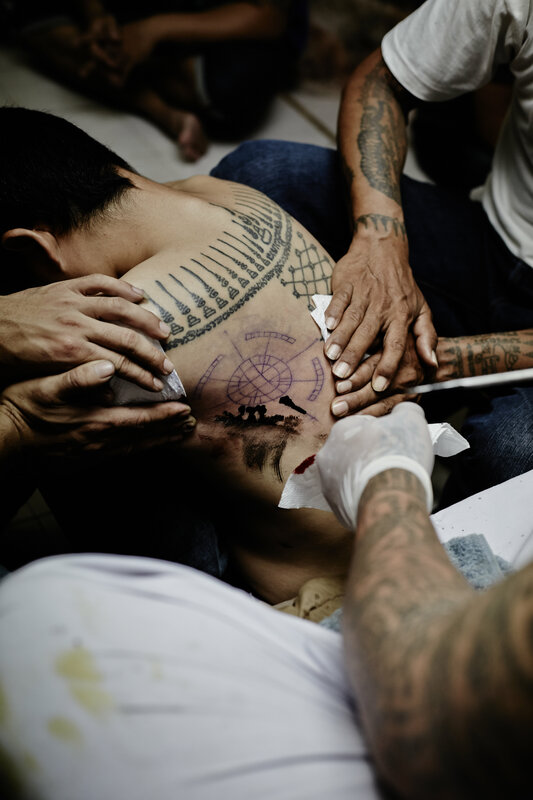 Ajarn Neng, 38, is one of Bangkok’s most well known and respected Sak Yant tattooists, a practise popular among mostly working class Thai’s, and increasingly, foreign tourists (thanks to the celebrity of one, Angelina Jolie). Steeped in superstition, the practice of Sak Yant dates back thousand of years, to the very beginnings of Theravada Buddhism in both India and Nepal, where sacred hymns, verses and mantras were married with geometrical patterns and animist imagery to pay homage to the spirits and summon up their mystical power. Today Sak Yant exists for much the same reasons – to bring good luck, good fortune and protection to the bearer, and at times, reasons that are a little eclectic. For the young man in front of me, it’s to right the wrongs of a drunken night out in his teens and to cover up something he doesn’t remember getting or know the significance of. Embarrassed, he asks Ajarn Neng to help him. Ajarn Neng taps fervently with intense focus and minute precision. Though this tattoo is one of dozens he’ll complete today, he makes sure the experience is one the young man will not only remember this time, but perhaps hold the key to changing his future. Wiping the needle clean, Ajarn Neng hands the young man a wet wipe to soak up the blood, turns him around, places his hands firmly on the young man’s shoulders and begins chanting. “Bring to him protection and influence, bring him good fortune and riches …. “ Ajarn Neng murmurs purposefully in Pali language as the young man rocks back and forth, his eyes clenched shut, his hands pressed firmly together in prayer position. Known as Khatha or spells, these ancient incantations form an essential part of the process and are seen to be a calling on the spirit gods to infuse the Sak Yant with their power. After several minutes Ajarn Neng blows a short sharp breath onto the the young man’s neck and sprinkles him with sacred water shaken from a bundle of bamboo reeds. Bowing reverentially one last time, the young man picks up his Thai Post jacket off the floor and stumbles outside for a cigarette. To describe Ajarn Neng as a holy man is probably a little misleading. He’s not a monk, but a master, a teacher, a learned scholar in the sacred art of Sak Yant and still relatively young in the role, though he’s been officially practising now for just on ten years. “Being an Ajarn in Sak Yant was not something I planned, but when I realised it was what I must do, it was as if everything before had been leading me to that moment”, he explains. Born premature, with a hole in his heart and weighing just 1.6 kilograms, Ajarn Neng was not expected to survive more than a few days after his mother gave birth. Though he did pull through, major congenital problems cropped up again at the ages of four and six and in the latter instance, he had to be resuscitated after a massive heart failure. Then, at the age of twenty five and suffering a deep depression, Ajarn Neng attempted suicide, swallowing 62 pills and a bottle of insecticide. Though he entered a coma, again, miraculously, he recovered. “In each instance, where my life was in danger, my mother would go to the temple and she would pray and give merit and plead with the spirits for my survival – and each time, though the odds were against me, somehow I survived. So when I was given the chance to live a fourth time, I started to think very deeply about this. I asked myself, ‘why have I been given the chance to live so many times?’ I thought it must have something to do with my mothers beliefs and the spirits. Something was guiding me and I started to feel maybe it was my destiny to do something on a spiritual level. A short time later I went to the temple and lived as a monk for three months, and it was there I first saw the practice of Sak Yant”. In those early years Ajarn Neng describes his fascination with the world of Sak Yant as something of an obsession, skipping work in his family’s furniture business on a regular basis to spend time with senior Ajarn’s and absorb everything he could. To learn Sak Yant is to step back in time and become learned in one of the world’s most ancient and sacred traditions. Not only is there the intricate art work of the tattoos, which consists of almost 1000 different graphic images, as well as the difficult and precise process of application with a long and very pointy stick (known as Khem Sak), there’s also the entire Pali and Khmer script to master as well as a raft of secret spells, chants and mantras via a series of cloistered initiation rites and sacred ceremonies. In Ajarn Neng’s tiny studio another young man bows down before him, then enters into an intense discussion about why he is here and what he is after. Though handsome and trendily dressed, the young man is afflicted by a dark facial birthmark, something which he feels self-conscious about and which is affecting, he feels, his ability to meet girls. Ajarn Neng decides on the symbol of two lizards intertwined, an ancient logo of sorts that is seen to summon up the spirits of sexual attraction and desirability. As well, he will use an application of a red coloured oil instead of ink, which is infused with a mixture of special herbs and considered even more effective in terms of its spiritual potency. However, getting the spirits to compose a lifetime of riches is not just as simple as an afternoon in Ajarn Neng’s little shophouse. For all who receive the Sak Yant, a series of vows or ‘precepts’ must be taken – a bit like the Ten Commandments for Buddhists. Though each Ajarn has their own version, all are built on essential Buddhist principles such as ‘don’t cheat on your partner, respect your mother and father and don’t take illegal drugs’. Extreme additions can also sometimes include not eating certain fruit and vegetables or reptiles such as snake or crocodile, or else the tattoo might lose its powers. Though Ajarn Neng believes it’s important to honour the traditions of Sak Yant, he also takes a slightly more holistic approach, believing that the Yant are there to remind the wearer to live the life of a dutiful Buddhist, committed to doing good, to generate positive karma and ultimately, to get a better deal in your next life. Watching clients stream into Ajarn Neng’s studio though, it’s clear what people are wanting, more than anything, is to make this life better. Whether it’s in love, business, with money or for overall protection, there’s an overall feeling, an emotion in the room, that most are seeking what we all are – solace, peace, fulfilment, happiness, a life without sorrow and pain, a life without struggle. “There are usually three different types of people who come to see me’, Ajarn Neng says. “First there are the people who know about the Sak Yant and its power. They understand fully what they are doing and why and they take the ritual very seriously. Then there are the people who are desperate. They have run out of options and they don’t know what else to do. For them, it’s the end of the line. Then, lastly, there are those who just want a Sak Yant because it’s fashionable. They don’t understand it but they like the way it looks and they see other people wearing it so they think it’s cool. For me, I don’t judge. I welcome everybody here and I see my role also as a teacher as much as an artist. It’s my job to educate the wearer about what they are putting on their bodies and the meaning. That’s why I don’t take students, people under 20 years old or anyone who has been drinking”. Like all Sak Yant masters, the ‘profession’ is a lifelong commitment and a calling, though Ajarn Neng does worry about the future of his family (a wife and two boys), and how he will provide for them in years to come. With simple tattoos starting at just 150 baht ($4), it’s not exactly a road to riches, though he does offer additional services such as magic spells and exorcisms for anyone who wants them. Whatever you believe, you can’t deny the process is powerful, with the potential to transform, even just momentarily, the mindset of the bearer and give, if nothing else, hope. When the man with the birthmark rises to his feet, he looks somehow calmer and more relaxed, his mood obviously lifted, a distinct glint in his eyes. As he moves away, the next client, a woman, hurries into position, keen to get started and for the needle – and Ajarn Neng – to weave their magic.